Sue Meyer is one of Fiona's biggest fans. She visits the zoo almost every day. WCPO's Kevin Necessary even drew Sue into the book he published with co-worker Lucy May, "My Best Friend Fiona." The Queen of Cincinnati celebrates her second birthday this Jan. 24. We're talking about Fiona the hippo, of course. One woman who knows Fiona very well is Sue Meyer. She's not a zoo employee, but she lives nearby and visits Fiona nearly every day - rain or shine, 90 degrees or 40. 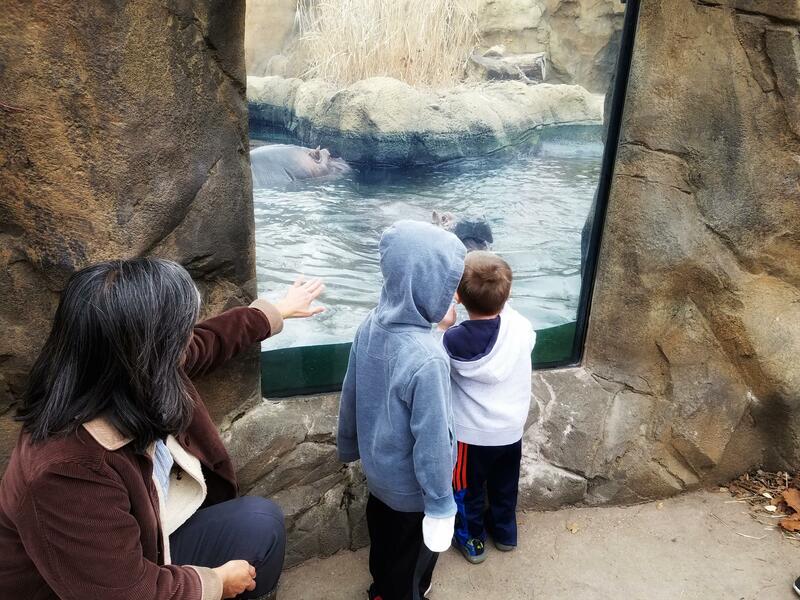 WVXU's Tana Weingartner caught up with her at Hippo Cove on an unseasonably warm January afternoon. WVXU's Tana Weingartner speaks with Fiona fan Sue Meyer at Hippo Cove. Meyer says Fiona is still capturing hearts with her "impish" ways. "She's just more joyful everyday and she hasn't lost that," Meyer says. "She's consistent with her joyful nature. And she always has that smile on her face, I can't get away from that smile she has." Meyer first visited Fiona on the day she went on public display and she's been hooked ever since. Most days you can spot her tucked into a corner bench with her iPad in hand, enjoying the view and hippo antics. She says Fiona always brings a smile to her face and lowers her blood pressure if she's feeling stressed or turns a bad mood around if she's feeling down. When asked if she has a birthday message, she says with a laugh, "Fiona, just stay joyful, just be yourself. 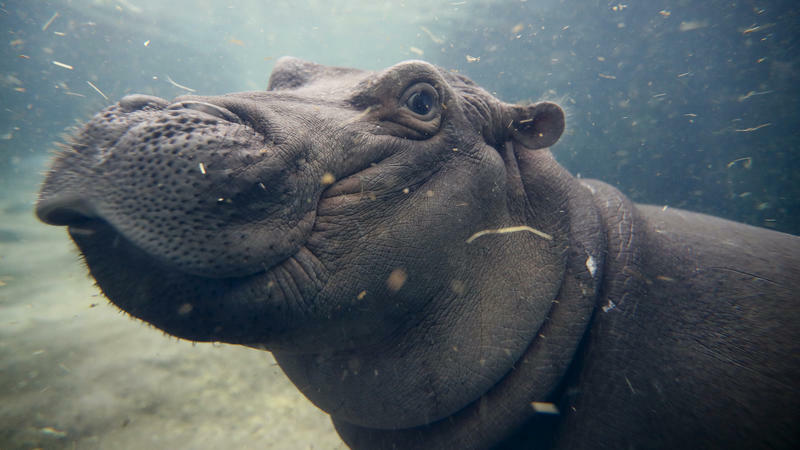 That's so crazy for me to say about a hippo but I just know that she'll always be such a joyful animal, a joyful hippo, and I like to tell other people about it because they don't always understand - people who don't live in Cincinnati. So, I try to just share that with them when I can." Meyer says Fiona seems to like children the most, perhaps because Fiona's still so young herself. Arnold's Bar & Grill, Blue Ash Chili, Sharonville's Roc-A-Fellas pizza and Fiona get national attention Monday, July 30, when a half-hour episode of Man V. Food airs on the Travel Channel.